At the headwaters of the Amazon River system in eastern Ecuador, the nighttime jungle is not quiet at all. The chatter of nocturnal canopy birds and crickets, mixed with the submarine sonar–like pinging of tree frogs, is startling to the first-time visitor. The 80 or so Waorani villagers who live here find comfort in these sounds. They tell them that their ancestral home is healthy, that it still teems with life, that the relentless march of oil wells and logging into the jungle hasn’t reached here yet. Waorani hunters leave their village each morning to hunt for food. They’re armed with spears to take down wild boar and blowguns to pick off the woolly monkeys that perch high up in the forest canopy. And though they sometimes must wander farther than they once did, before the arrival of outsiders in this remote region, there is still enough game to sustain them. The jungle provides everything they need, from the fruits of achiote and genipa plants, which they use to make body paint, to the liana vine, which supplies the toxic black juice they put on the points of their darts and spears to paralyze and kill their prey within minutes. Inside a dirt-floored hut constructed of layered palm fronds, I speak with a muscular, middle-aged man, Penti Baihua, who knew nothing of the outside world until he learned Spanish at an elementary school run by missionaries. He makes the case for the survival of his people, whose way of life today is largely unchanged from that of their ancestors centuries ago. But increasingly, he is seeing oil spills contaminate the jungle and eliminate the game these indigenous people depend on. He is seeing cocoa and coffee plantations replace the rainforest. He knows precisely the stakes for which he is fighting. “We do not want to disappear,” says Baihua, leader of the Waorani village of Bameno. To an outsider visiting the rainforest of Ecuador’s Yasuní National Park, one of the most biologically diverse places on earth, it seems almost inconceivable that Baihua and his people have survived as hunter-gatherers there in the 21st century—and even harder to believe they’ll be able to do so for much longer. Momentum is not on their side. This year, in January, drilling began on a new oil well by Petroamazonas, a division of the Ecuadorian state oil company Petroecuador, just 15 miles from the village. 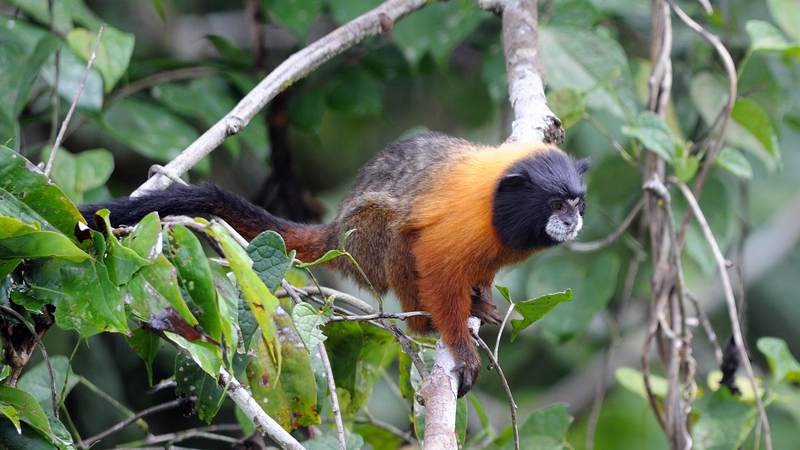 It is the first of 97 wells likely to sprout within the national park as a result of the Ecuadorian government’s decision in 2013 to allow petroleum extraction inside the wildlife and anthropological reserve. Ecuador’s constitution protects the country’s indigenous inhabitants, including the 2,000 or so Waorani, from commercial exploitation—except in the case of oil extraction. If past experience is any guide, the oil development will bring roads into the jungle, followed by illegal loggers, palm oil and cocoa plantations, homesteaders from Ecuador’s impoverished Andes highlands, electrification, and modern housing—the trappings of industrial and economic development. Meanwhile, another force pushes from the south. For the Waorani of Baihua’s community are not alone in the forest. It takes two days for us to reach Bameno aboard a motorized canoe from Coca, the nearest town with roads and cars, on the Napo River in Ecuador’s eastern Oriente region. Baihua is with us, and as the boat approaches the village along an eerily quiet stretch of dense brush, he points out a bend in the river. My fellow passengers fall into a tense silence. This is a danger zone where members of two Waorani clans, the Taromenane and Tagaeri, have attacked intruders in the past, with deadly results. 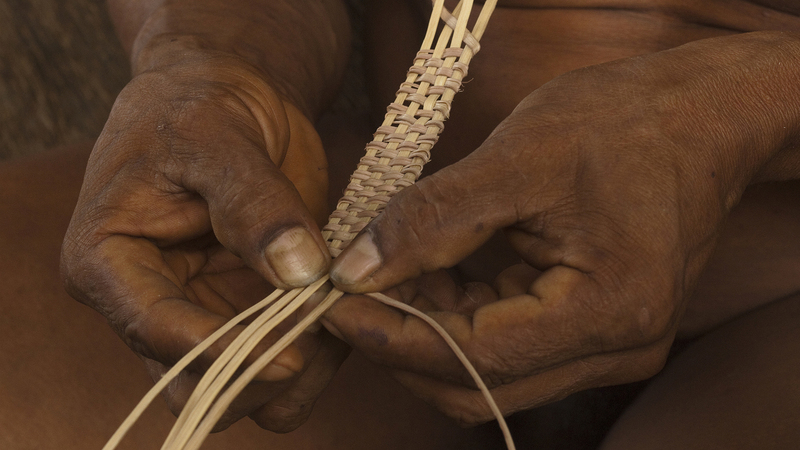 The Waorani can be divided into three groups. After the arrival of American missionaries in the 1950s, a large number of the historically nomadic hunter-gatherers converted to Christianity, were educated in Spanish-speaking schools, wore Western clothes, and eventually settled in modern townships as part of the government’s campaign of national integration. Baihua and his “recently contacted” tribe, however, retained their traditional ways and have limited engagement with outsiders. A third group, the 100 to 150 “uncontacted” Taromenane and Tagaeri, continue to live deep within the rainforest, in almost total isolation from the rest of the world. When Taromenane and Tagaeri happen upon outsiders, including the rest of the Waorani, they tend to throw spears. They appear to believe Baihua’s people are traitors for engaging with the world outside, or possibly for not keeping that outside world away, Baihua tells me. But that’s a matter of speculation. 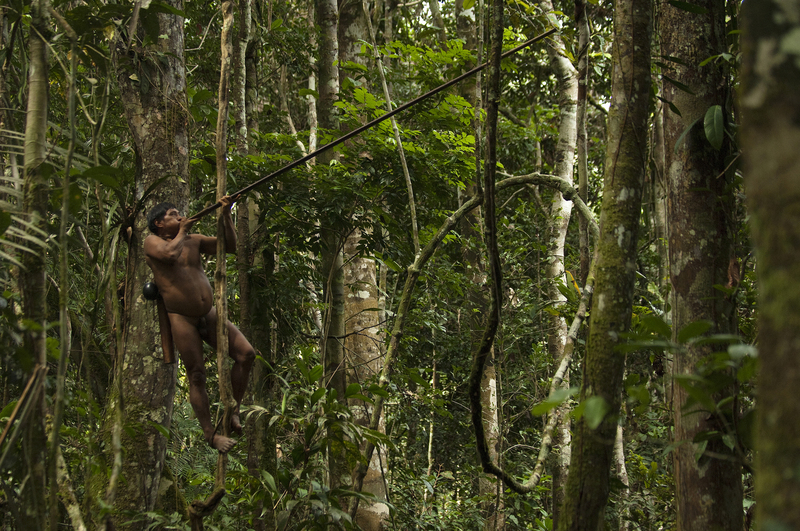 There is no way for Baihua to communicate safely with the uncontacted or to tell them he is as worried about their future in Ecuador’s Yasuní park as he is about his own. An unassuming leader, he is equally at home helping his wife with her weaving or washing the breakfast dishes as he is leading a hunting party up a mud-sucking riverbank, stepping lightly past anacondas and caimans. He recognizes that Western civilization is closing in on his people. Indeed, he uses a satellite phone to keep in contact with the outside world and his lawyer in New York. While he wages a campaign for the rights of his people within Ecuador’s multiethnic society, he must also worry about territorial feuds with his rainforest neighbors. In 2003, 26 uncontacted were massacred by Waorani who were allegedly incited and armed by loggers eager to harvest the forest’s ancient cedars. A decade later, a group of uncontacted came across two Waorani elders in the jungle and speared them to death. 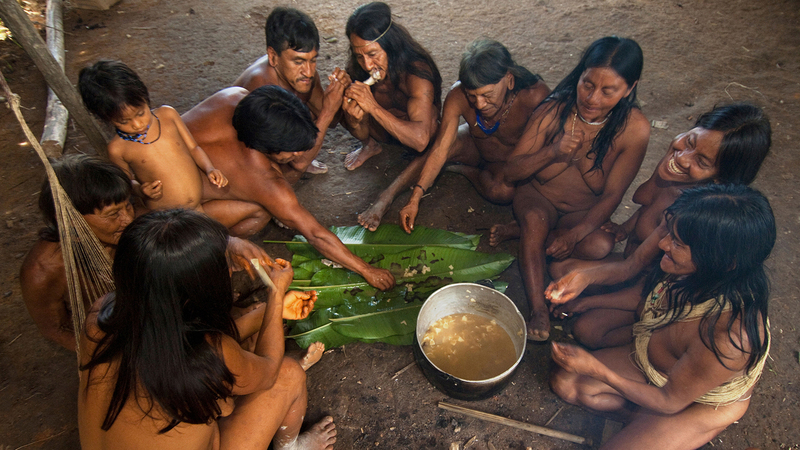 In retaliation, Waorani murdered 18 members of the uncontacted tribes. And the conflict continues. Last year, a Waorani couple from Bameno were attacked as they floated upriver. The man was found dead with nine spears in his body; the woman survived and made it back to the village with three spears in her. The quest for oil began in the Amazon region in the 1970s, when helicopters carrying seismic crews fanned out over the jungle in search of the crude oil believed to exist in vast deposits beneath the ground. Their work paid off: By 1990, some 214,000 barrels of oil flowed daily from the oil fields around the boomtown of Lago Agrio, then through the 300-mile Trans-Ecuadorian Pipeline to the Pacific Ocean. The steady supply of crude enriched Texaco, Gulf, and other foreign companies, as well as Petroecuador. But the ecological cost was staggering. New York attorney Judith Kimerling, then acting as NRDC’s Latin American representative, catalogued the environmental toll in Amazon Crude, her 1991 exposé. The drilling operations produced 3.2 million gallons of wastewater a day, which the oil companies stored in unlined pits that leached toxins into the soil and waterways. Also devastating was the estimated 16.8 million gallons of oil spilled from pipelines in the region. The village elders of Bameno recall helicopters in the skies over Yasuní National Park that dropped lighted dynamite to chase Waorani hunters away from areas the oil companies wanted to explore. Kemperi, one of the Waorani elders, tells me they took up their spears and killed at least 20 oil workers in skirmishes that left several of their own dead as well. According to Waorani lore, fighting worked. 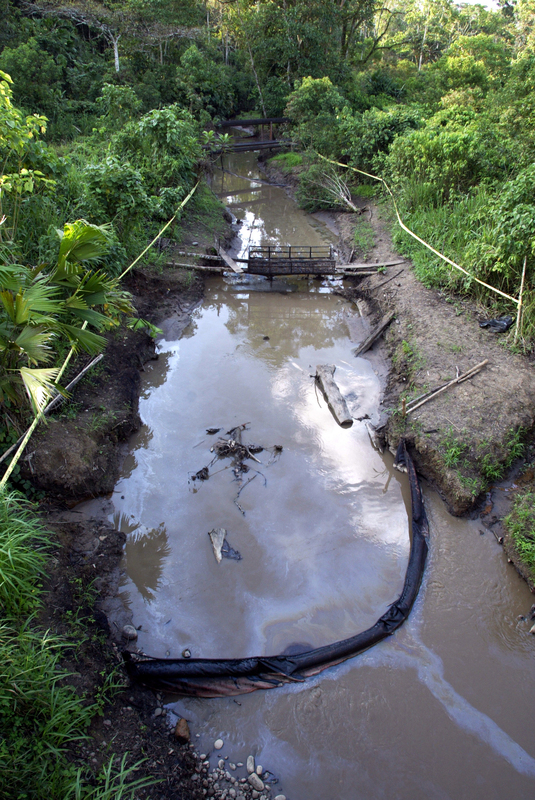 The oil crews left the people of Yasuní alone for at least a decade. Land outside the national park was just as oil-rich, and easier to access. But the Waorani’s peace didn’t last. Those early seismic explorations had determined that more than a billion barrels of oil sat underneath Yasuní. Meanwhile Ecuador—despite charging the foreign oil companies up to 90 percent of revenues in fees and royalties—saw its foreign debt grow to more than $42 billion. Over the protests of indigenous people and environmentalists, the oil companies set their sights on Yasuní. Then, in 2007, Ecuador’s populist socialist president, Rafael Correa, announced an innovative plan to keep the oil reserves within the national park underground and to protect the Waorani who lived there. He called his scheme the Yasuní ITT Initiative (the initials refer to oil fields within the park) and delivered a challenge to the other nations of the world: In return for a pledge of $3.5 billion from governments and NGOs, Ecuador would leave the rainforest intact. 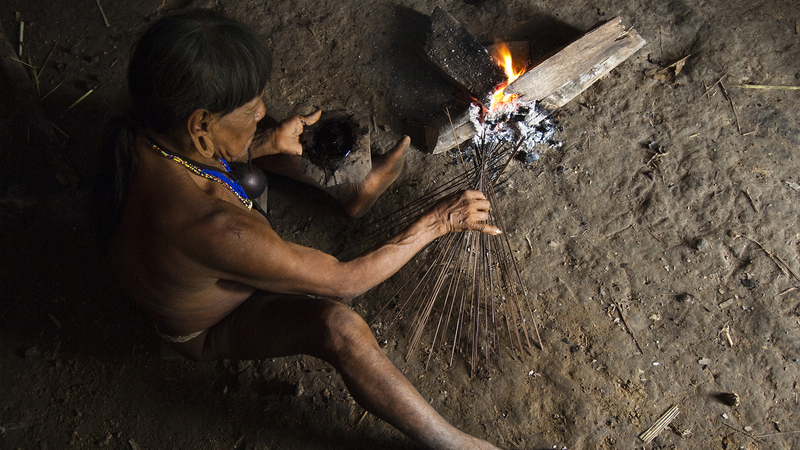 After an initial outpouring of support and publicity, the ITT Initiative generated just $200 million in pledges before Correa withdrew the offer six years later and said, “The world has failed us.” Petroamazonas announced plans for 651 wells on six blocks of land in and around the national park that essentially targeted the remaining ancestral hunting lands of the Waorani people. This new fight would have to be waged with words, not spears, he thought. 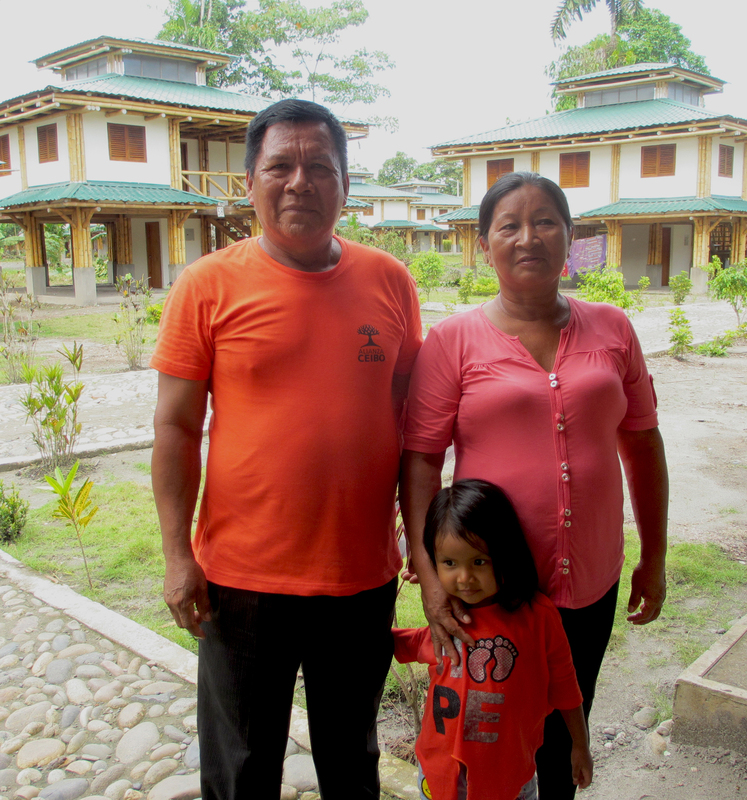 In his modern house about 60 miles from Bameno, “Ermenegildo” Criollo, a leader of the Cofán indigenous group, wears casual pants and an orange T-shirt. As he looks out at the village of Dureno, with its tidy streets, basketball court, and 108 modern homes, he recalls his first encounter with the men from far away. He was five years old in 1973 when he heard the whump whump of a helicopter overhead. Months later, the flying machines returned and began dropping “huge machines”―bulldozers that knocked down trees and cleared huge swaths of the rainforest around the future site of Lago Agrio, the oil field developed by Texaco that would eventually produce 1.5 billion barrels of oil. Criollo recalls workers giving his father cheese, vanilla candy, and a can of diesel oil as compensation for drilling on his family’s land. His father threw away the cheese because it smelled funny. They ate the candy and used the diesel to light lamps. Within months, Criollo saw his first oil spill, one of many that would poison the land. “It painted the river black,” he says, a hint of astonishment in his voice even years later. Both banks of the river the villagers used for drinking and bathing were covered with oil. In time, the Cofán leaders realized they could make a deal with the oil companies, or they could suffer on without one. Formal agreements were signed three years ago allowing drilling in all but a small parcel of Cofán land that was declared off-limits. In exchange, the oil companies paid to have construction crews move in and build a new house for each family of the community, each one with a long-lasting aluminum roof. There is still no electricity, cell phone access, or internet service, Criollo notes, and the animals the Cofán have hunted for generations have mostly disappeared from the jungle around them—not that the young people seem to care, he says. Before Baihua can even attempt to make any kind of deal, he must first win official recognition that the indigenous people living in Yasuní control what happens in their territory, both above and below the ground. That’s the basis of a new proposal formulated by Baihua and attorney Kimerling, who met Baihua in 1989 while researching the oil industry in Ecuador and has represented his people pro bono for years. In April, she and Penti will travel to Ecuador’s capital, Quito, where they have requested a meeting with the country’s president, Lenín Moreno, to make their case. Ecuadorian law recognizes the rights of indigenous tribes to practice their traditional way of life, but on the ground, those rights haven’t always been protected, says Kimerling, a veteran of previous battles over land use and rights in the Ecuadorian rainforest. A 1990 legal document, for instance, appears to gives the Waorani title to some Yasuní land. Unfortunately, the document includes a clause stipulating that the Waorani cannot obstruct oil or mining on their lands. It assigns title to the land to the government-recognized Waorani Nationality of Ecuador (NAWE), rather than to individual tribal groups. Yet despite several attempts to form a unified tribal entity to represent all of the Waorani, including NAWE, no such entity has ever succeeded in speaking for the whole group for very long. That’s in part because Waorani society is organized in fiercely independent family groups made up of equals. The notion of organizing, or telling another person what to do, is alien to them, says Baihua. “No one goes to the home of another to obligate,” he once told Kimerling. On top of that, the Waorani today are fractured into three groups with very different priorities. Meanwhile, the “oil frontier,” as Kimerling calls it, has opened on six blocks of land in what has traditionally been Waorani territory, both inside and outside Yasuní National Park. 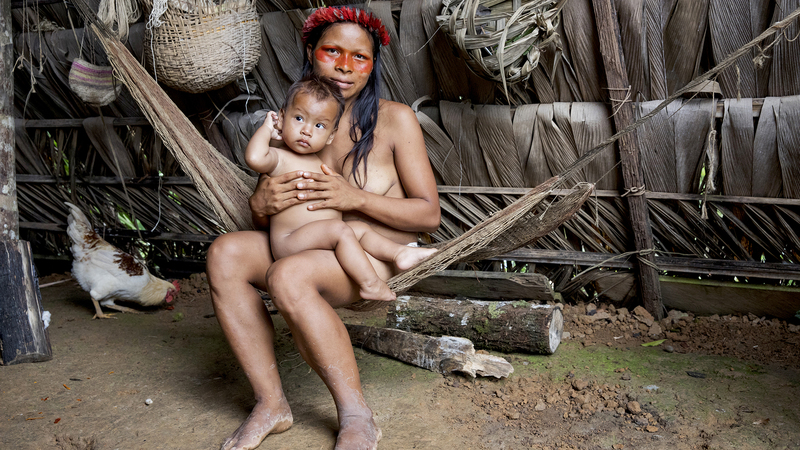 She believes it’s crucial to protect, first, the uncontacted tribes in the park, who stand to lose the most if oil exploration and production destroy their hunting grounds. 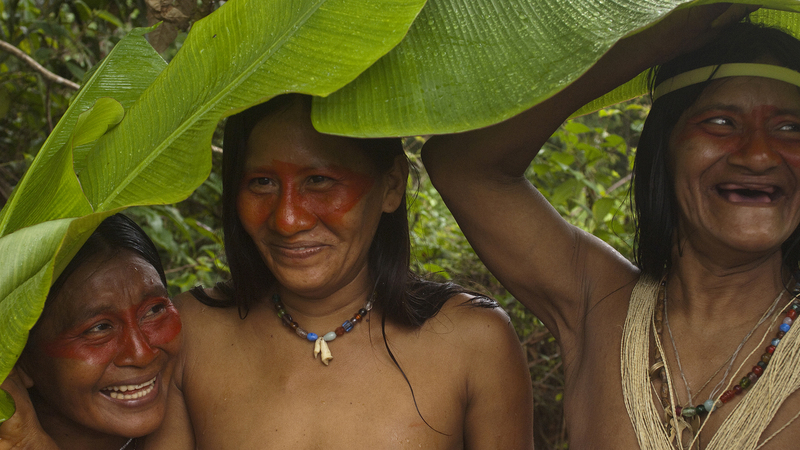 Without a rallying cry from the uncontacted, she says, oil wells will proliferate deep inside Yasuní. Within 10 or 20 years, it will be too late for any tribe that wishes to maintain its traditional culture. At the gateway to Yasuní, Baihua takes a break from preparing his canoe for the trip downriver to look at a map of the national park. With a thick and gnarled hunter’s finger he traces a line from west to east across Yasuní, about a third of the way down from the park’s northern edge. This has to be the line, he says. The northern sections of the park have been lost and are no longer suitable for traditional tribes. 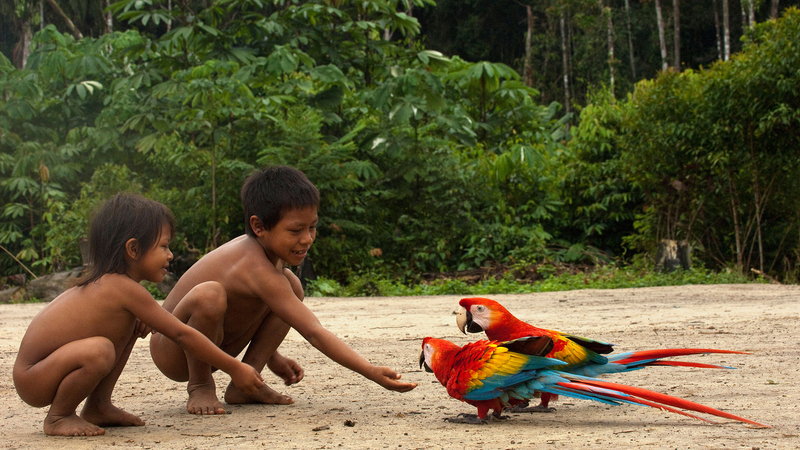 But if everything south of this line—about 3,000 square miles—is allowed to remain untouched, there will be enough rainforest for his people and the uncontacted tribes to live in peace. Baihua’s people are survivors. Adaptability is part of their culture. 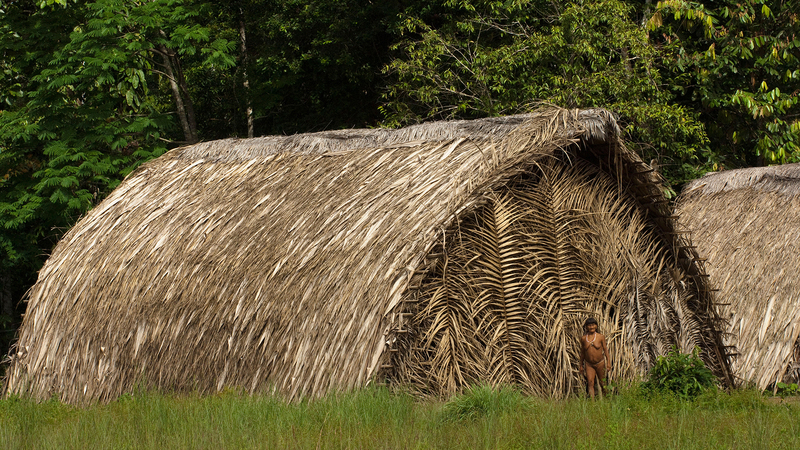 Once, they were jungle dwellers who eschewed the river and its bounty—as the uncontacted tribes still do today. Now, Baihua’s people travel by boat and, when boars are scarce, take catfish and piranha from the river. They have learned to grow manioc and plantains on the outskirts of their village. The Waorani don’t distinguish between the health of their people and the health of their rainforest, he tells me. Caimans and tapirs, capybaras and toucans, are cause for celebration whenever they are sighted. The Waorani’s trancelike community dance is performed to lyrics that translate to something like “This is us, this is the uncontacted people, we are the land, we are the animals.” And that’s what they wish to remain. Jair Bolsonaro says there’s too much “wealth underneath it” to leave the rainforest alone. In what the modern world sees as coal and oil, this New Yorker sees ancient plant species—and hope.